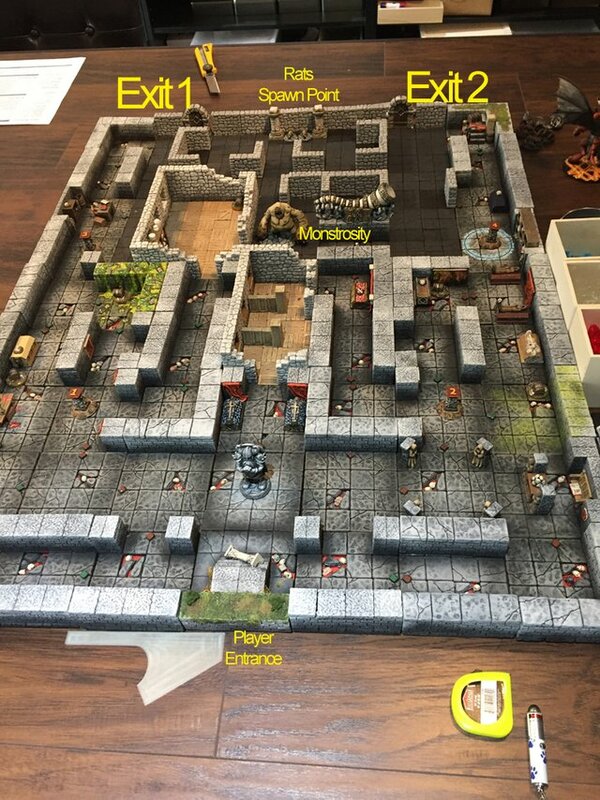 My Roleplaying Game Table: Frostgrave Part IIsteemCreated with Sketch. Here is a Frostgrave scenario we played in coop mode. The players have a diminished warband (1 wizard and 3 soldiers). At the beginning of the game, they deploy their troop at the entrance (see picture below) and their goal is to exit... but he is the twist... When someone try to open one of the 2 exit doors for the first time, they need to roll a D20 and only on a roll of 16+ is it the right door. Each turn, a new giant rat appear at the rat spawn point and is activated immediately. The Monstrosity start the scenario in the center of the map, but randomly move every turn unless it has a line of sight with a player's miniature. While making their way to the exit, players can grab treasures placed all over the map (total of 10 on this map if I recall well) The content of the treasures and XP (Experience Points) are determined AFTER the game is over. Wow you've put a lot of work into the details! Very nice! That's legit! What did you use for the tiles?